An insightful, multi-year study of the Open Source Software Commons, led by Professor Charlie Schweik from the University of Massachusetts, analysed more than 170,000 projects, to help explain what leads some open source software projects to ongoing collaborative success and others to early abandonment. Leadership by doing (working more hours). Knowledge continuity: Someone on the project since its early days. Utility as represented by downloads. Slightly larger development teams and attracting outside communities, although development team still can be small (2 – 3 people). Clear project vision and goals established and articulated. Task granularity: Projects have small tasks ready for people who only can contribute small bits of time. A diversity of motivations from within the team. More formalized institutions exist in a relatively small number of cases, but these tend to fall in the successful growth class. As you can see, most projects are abandoned. Of those that are successful, the vast majority of them are retain a small, sustained team. However, attracting external developers greatly increases your chance of long term success. 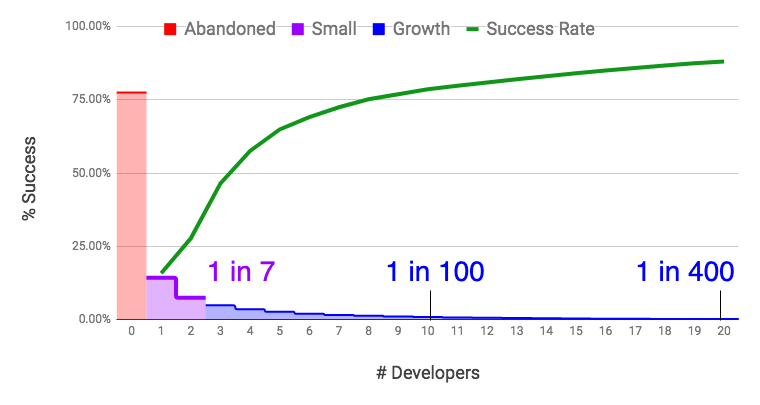 (A project which attracts 10 or more developers is a 1 in 100 project).